Buying A Manufactured Home Nigeria - Pros And Cons. Everything You Need To Know. Buying A Manufactured Home In Nigeria - Pros And Cons. Everything You Need To Know. Buying a manufactured home in Nigeria raises a lot of questions among friends and family because majority of Nigerians are only familiar with building construction using sand and cement. However, manufactured buildings are commonplace in the developed world. And as Nigeria evolves to compete in the global marketplace, more and more forward thinking Nigerians will begin to adopt this new style of home construction. As a potential customer thinking of buying a manufactured home, you're probably wondering, "will the manufactured building be as solid as the regular sand and cement building commonplace in Nigeria?" Another question that arises from the first is, "how long will the building last?" Be assured that the questions above (and any others you might ask) when buying a manufactured home for the first time are perfectly normal. You see, home buying cost a lot of money. And so, it's perfectly normal to be certain you're making the right choice. 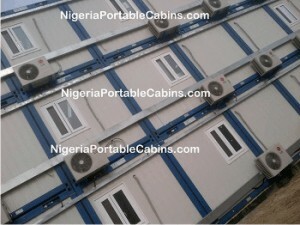 In fact, this section of this Nigeria portable cabins and prefab homes web site was created to answer any questions you might have regarding investing in manufactured homes. So, let's attempt to answer your questions here. First question: "Will the manufactured building be as solid as the regular sand and cement building commonplace in Nigeria?" Answer . . . yes. Remember, manufactured homes are constructed from steel materials. And steel is solid. Second question: "How long will the building last?" Simple answer: As long as you want it to last. Here's a fact of life . . . things degenerate when we abandon them. And they last when we take care of them. This principle applies to both buying a manufactured home and buying or building a sand and cement house. a similar building in the same neighbourhood or same street. You will be amazed at the difference between the building that is inhabited by humans and the one that have been abandoned and inhabited by roaches and mice. Obviously, if you're a potential home buyer considering buying a manufactured home, you will likely have some more questions to ask. For example, you may wonder whether manufactured home financing follows the same procedure as regular home loans. You may also wonder whether you can find Nigerian banks willing to offer manufactured home loans or loans for mobile homes to customers considering that many are yet to grasp the benefits of prefabricated buildings over regular sand and cement buildings. A great way to secure your house is to get home insurance, right? As a first time manufactured home buyer, you may wonder: "will I be able to get a manufactured home insurance?" What sort of manufactured home foundations would apply to this building type? Can I get relocatable manufactured homes? Where will I get manufactured home floor plans when I decide to buy a manufactured building? Where can I get manufactured homes prices? What is the resale value of used manufactured homes? Is it similar to that for sand and cement built houses? Where can you get used manufactured homes for sale? Can I build two story manufactured homes or am I limited to just ground floor houses? Where can I get reliable and trustworthy manufactured home builders in Nigeria? Where do you get answers to all of the above questions? Simple. Just click any of the links above to get answers. Have a question not covered in the above list? Click HERE to contact us and ask any question you have. Alternatively, Click HERE to request a quote.